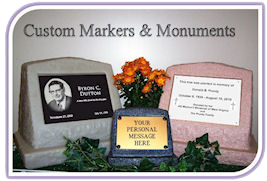 Our Monuments and Plaques are designed to go together, so the typical order will be for both a monument and a plaque. Of course, if you wish, you may order just one or the other. You can get an overview of what we have to offer by visiting the Products page and, then, follow the links for more information. When you select a monument, you will be taken to the Product page for the monument that you have chosen. On that page, you can select from any of the eight color choices and add the monument to your Shopping Cart with the “Add to Cart” button. From there, you will want to continue shopping to select a plaque from the five choices available. Please be sure to select the proper size of plaque to match the size of monument you are buying. The Letterboard and Whiteboard plaques are sold “as is” without any need for customization. The Black Marble, Dye Sublimation, and Ultra-Mat Plaques all allow you to design them with any text and photos that you may wish to use. Depending on the plaque you choose, we will convert color photos to black and white before the engraving is done. The Dye Sublimation Plaque is the only one which can work with color photos or text. When you are on a page for the plaque of you choice, simply click the “Begin Plaque Design” button to get started. We have a built-in graphics design module on each product page that allows complete customization. Our page for Using the Graphics Design Tool will provide you with some tips to get started. Once you have finished your design, simply click the “Add to cart” button to complete your plaque selection. We realize that some customers may not be comfortable with doing their own graphics design work. For that reason, each plaque that is customizable, comes with an option to commission us to do the design work for you, for a small fee. If that should be your choice, click the “Please Design It For Me” button. This button will reload the page with a form to gather some basic information, text choices, and provide a way for you to upload a photo. You may also display a “Custom Design Guide” to guide you through the form. After you have completed the form, fill in the CAPTCHA code, click the “Submit” button for the form, then click the “Add to cart” button. From that information, we will do the design work and provide you with a proof for your approval.